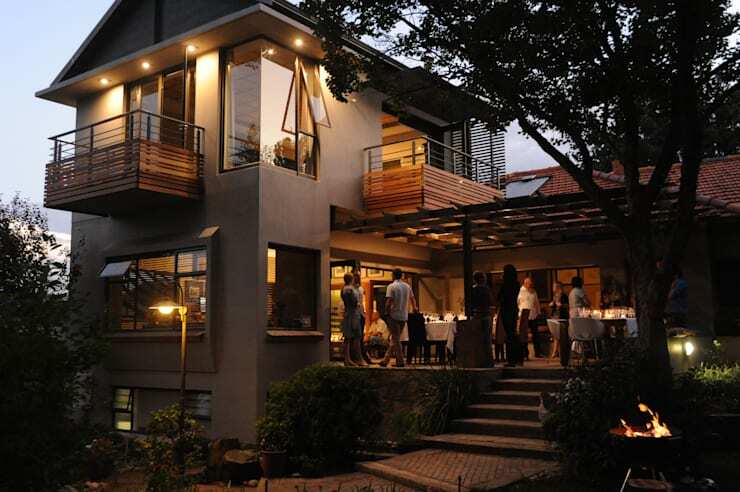 At homify, we love exploring local architecture, which is why this ideabook by South African design professionals Reinier Bronn Architects & Associates is going to delight you today. 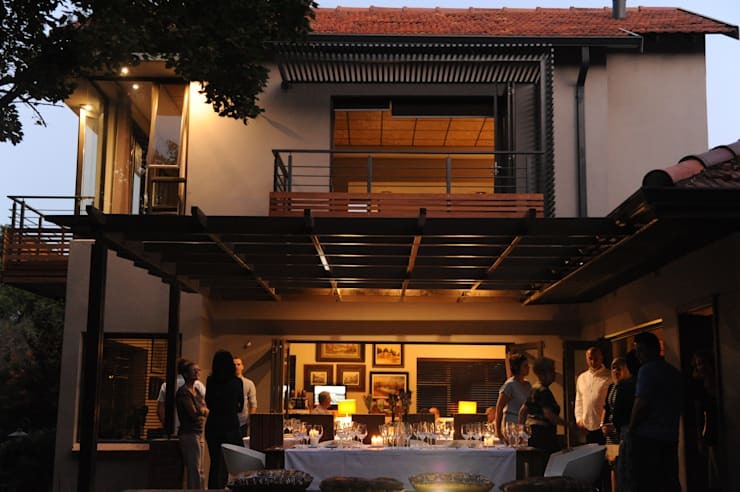 These designers have constructed a home in Bloemfontein, nicknamed House Bronn, that is specifically designed for entertaining. For all of you who like to host Saturday braai's and afternoon lunches outdoors in the summer months or even if you just like to sip your morning coffee out in the fresh air, this is a home that you have to explore! 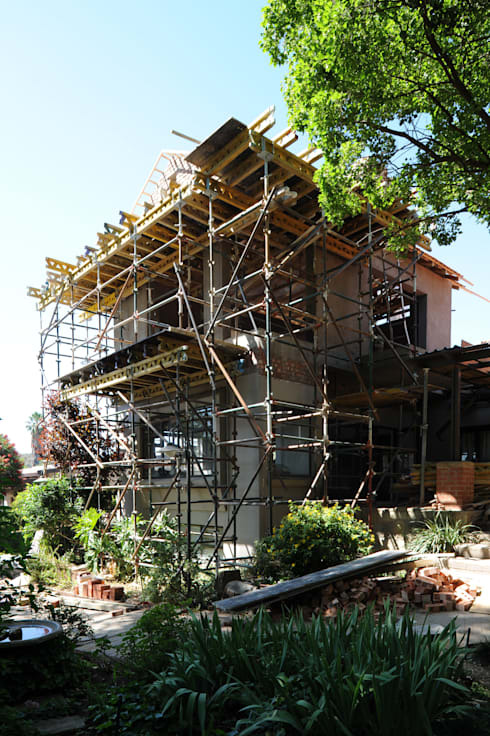 We will see how the architects have expertly married the interior and exterior spaces, creating a dream home! From this angle, we can see how the modern and trendy family home opens up onto a stylish terrace area that is covered by a pergola. The house features glass doors that slide right back, opening the interior and exterior spaces onto one another. This visually and physically expands the living area of the home. Underneath the pergola, there is a large table where the homeowners can entertain family and friends under the stars. The pergola offers a little bit of protection as well as a gorgeous design detail. The wood used for the pergola matches the finishes that we see throughout the exterior of the home, contrasting beautiful with the beige facade. You may also be interested in this: Step-by-step guide to building a pergola. If we look at the home from the front, we can see just how extraordinary it is. It extends over three levels and features an abundance of glass throughout the facade, creating that seamless transition between the interior and exterior spaces. We can also see that the upper level features wonderful balcony spaces that lead out from the more private spaces of the house. This allows family members to keep their bedroom doors open at night for fresh air or enjoy a cup of tea while looking at the surrounding views. We can also see how the entrance of the home leads up to the outdoor terrace, enveloping any arriving guests in warmth and charm the moment that they arrive. The cherry on top of this gorgeous design is the fire pit in the garden. 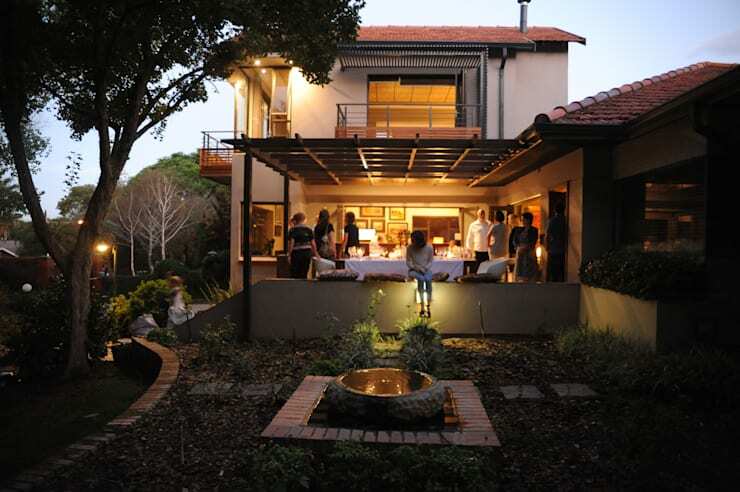 This provides the perfect spot to braai without the smoke interfering with the guests on the terrace! Also have a look at these: 6 braai ideas you're certain to love! The designers have left no stone unturned in this incredible design. From this angle, we can see the gorgeous garden that has been very strategically designed. Apart from the lush trees and flowers, the designers have also included a little stone courtyard into the design. A little water feature or pond truly enhances this area, adding some zen and serenity to the space. There is nothing more peaceful than the sound of a water feature! The designers have also added some stone bricks in the garden, which serves as a pathway through this area. Remember that your garden plays just as much of a role in the design as the facade itself so be sure to spend as much time on it as you spend on the design and decorating of your home! In this image, we can see the work and effort that went into the designing and construction of this beautiful home. This image shows that a dream home isn't born over night. It takes a lot of planning and strategy to end up with the finished result. This is why it's important to weigh up the pro's and cons of buying a home or building a home. Depending on your budget and your patience, one may work for you more than the other. Would you want an entertainment area like this one?